Do Budget Cuts Cause More Riots? 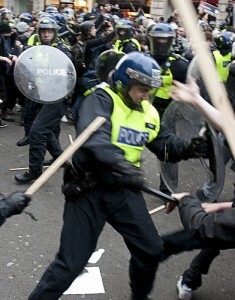 The UK riots continue as PM David Cameron and the Metropolitan police flood London with 16,000 officers in hopes of calming the civil unrest. Critics have suggested that this is the behavior of a generation that’s been ignored by the establishment. The anarchy on the streets of London has been attributed to high unemployment and disaffected youth, combined with a trigger event — the death of Mark Duggan, shot by police last Saturday. Once you cut expenditure by more than 2% of GDP, instability increases rapidly in all dimensions, and especially in terms of riots and demonstrations. We also use some additional, more detailed data on the causes of each demonstration to confirm our hypothesis that the link is causal. So, if you ever found yourself reading papers by Alesina and co-authors arguing that i. budget cuts can be good for growth ii. there is no punishment at the polls for governments cutting expenditure, and wondering why governments don’t engage in more austerity – maybe here is your answer. Even if (and it’s a big if, given the IMF’s latest research) Alesina et al. are right, and growth can follow cuts, the pain may be concentrated amongst some groups. If these become massively unhappy… it can start to look pretty ugly out there in the streets, and I doubt that that’ll be good for growth. The Guardian’s Datablog has a map of all the spending cuts made to local councils in the UK last year. Thirty-six councils got the maximum cut of 8.9%, with a 4.4% average across the total 350 councils. Former London Mayor Ken Livingstone has already jumped on the “spending cuts = riots” explanation, to much criticism. The U.S. labors under the illusion that 3/4 of us are middle class and that the rich somehow do something to make our lives better. In the UK they have no such illusion. 3/4 of them believe they are "working class" and that the rich (and "royalty") are crushing them. This rioting could drift to the US...and once it starts, lock your doors. Er... actually, a YouGov poll last year found 2/3 of British people identify as middle class. 80% of Brits are "Working Class" (or lower! ), because they make less than 20,000 Pounds/year. These are easy stats to come. What you said was that '3/4 of them believe they are “working class"', and no, they don't. I actually kind of agree with your general point about attitudes, but pulling "stats" our of your arse is just annoying. Rosario's right the working class in the UK's shrunk over the last 50 years, most people are now middle class. But Eric has a good point in that the UK has less belief than the US in the morality of free markets - ie you are worth what you earn etc. On the other hand, the UK's way behind a lot of other european countries, particularly the Scandinavians. Merely a silly Brit next to the Americans idiot.. It's inaccurate to label citizens who protest AGAINST government costs anarchists. Anarchy is an ideology that espouses total absence from government. Therefore, how does it make sense to dub protesters against reducing government anarchists? It is a non sequitor. It's questionable how much of the cuts have actually happened yet, rather than simply being planned. The cuts are over many years and tended to be more at the back end of the government's plan, while tax rises were frontloaded and have already happened. I don't believe these rioters will be reading enough to know when and where cuts are going to happen, so unless there's a tangible effect of the cuts on the ground then I doubt the cuts are to blame. I would say it's quite unlikely they're feeling the effects of cuts yet, but it's a good excuse to throw about. Well, I would think this is something that would happen systematically. Governments create wealth too easily for people to enjoy, a false paradise if you will. And when this incessant and unnecessary amount of government spending becomes noticeably too high and bothersome then the austerity measures proposed will never be taken likely. A BIG example to use is Greece. Once people are living off too much EXCLUSIVE Government grants then the pampered populace will eventually never want to return to austerity measures or hard work. Riots are because we have an out of touch government.I do not condone the violence. So basically give them money OR ELSE? As many of the rioters and looters were teenagers, I very much doubt benefits - which they could not claim - would be a motivating issue. The images on the street do not show people worried about paying their electric bill or their mortgage, but selfish teenagers wanting the latest Nike trainers or HDTVs. As for university, I don't want to derail this topic with a full explanation, but the rise in student fees in no way stops anybody - poor or rich - going to university, as it's not real debt (like a mortgage or a credit card) and nobody has to pay anything back if they can't afford to do so. The last thing this, or any other government, should do is pander to those causing the damage. The government should be stood right behind those doing the right thing, those whose homes or livelihoods have been destroyed by this epidemic of greed and lawlessness. Of course, despite the clear relation between bigger cuts and more incidents, one may argue that there are many omitted variables that may explain this pattern, so it is hard to give this a causal interpretation without more controls. Is there a similar correlation between government austerity & rioting? Take a country that consistently spent 10% GDP: would it have fewer riots than a country that spent 20% GDP, then cut it down to 15% GDP? I'd like to know whether the root problem is "government spent too little" or "government promised too much". Then again, deep cuts probably only occur in times of financial instabilty and economic hardship: Times that would already suggest some inclination to social unrest. Seems like a murder and icecream sales thing to me. I am a little confused as to why ordinary citizens don't go out and beat up the rioters, there cannot be that many of them? The law abiding citizens surely outnumber the rioters? Particularly if they are lighting cars on fire or looting stores/homes. I think of a dozen teenagers were caught trying to light a car on fire on my block the residents would beat the crap out them. People are not hard to scare off when they know they are breaking the law. They are already mentally on the defensive. Plus, aren't the people who are rioting the same people who are more inclined towards violence anyway, so those who aren't causing damage are peaceful, so won't fight back in the same way? Also, this isn't just a case of "a dozen teenagers" - over 500 people were arrested in one night. I doubt that that's the entire reason. I suspect that the fact that British law has for decades criminalized acts of self-defense might be a greater factor. « Previous PostShould Bad Predictions Be Punished? Next Post »Freakonomics Poll: Are you a Scion?